More Scaffolding - Please be Alert! The Family Mosaic block has just been clad in scaffolding for some much needed refurbishment. All good & well! But there is no security on the scaffolding at all - and anyone could climb it & gain access to any of the flats as easy as pie. Please always lock every door & window as securely as you can - and draw the curtains whenever you're not in the room. This will make any potential burglar think twice about trying to get in. 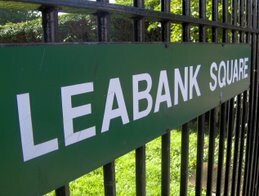 It's at times like this that Leabank Square really pulls together - so if any resident sees anything suspicious happening on the scaffolding - please call the police as soon as possible. Just look at all this activity going on in Leabank Square! Birds, bees, bulbs and loads of happy residents! Remember back to early October last year? I know it's been a long cold wintertime ago - but that's when we planted the beautiful purple crocuses kindly donated by the Eden Project in Cornwall. It was all in aid of Rotary Internationals work to eradicate Polio in the entire world. Some of us played a small part in that message by planting this stunning path of purple crocuses along the dividing fence on the green. They are starting to peep above the grass now - and really look lovely. If you get a chance - please take a cuppa down to the green - and admire their purpleness. They say all politics is local, but how local? Well now, for Hackney residents (including the Wick), the way local decisions are made, on everything from house-building to park benches and licensing to Olympic planning, could be changing very soon. London Assembly member, Andrew Boff, certainly thinks so. He came to Leabank Square Community Association’s latest meeting to tell us how he’s using a change in the law to set up a community council (a sort of urban parish council) for London Fields (http://londonfieldscouncil.org.uk/) and how the same idea might apply to the Wick. We all think of Parish councils as being something for the countryside, or small villages, like the one up North where I’m from, but few people know that residents in urban areas can set up their own (http://www.nalc.gov.uk/Publications/Booklets_and_Resources.aspx). Cities having very blurred boundaries (Where exactly is Shoreditch?? ), there are few places within built-up areas that can said to be a self-contained community, but if anywhere is, surely it has to be our very own Hackney Wick? So what would we do with an Urban Parish Council, or a Community Council if we decided to set one up? Well, for a start, the community council would have the right to be consulted on planning decisions in the local area, something that’s going to be a big issue for the Wick with all the Olympic developments and Lottery regeneration coming up. Urban parish/community councils can also share in the proceeds of new developments, make arrangements to put up more litter bins, get together to run allotments, organise local festivals or improve the local land and townscapes. Wouldn’t this just cost a lot more money and mean more politicians though? That depends. The sort of community council people want for their area is up to them. Some parish councils don’t collect money and are entirely voluntary, funding improvements using their share of planning and development fees, public subscription or donations. Others might charge a precept, usually not more than £20 a year, and some will use a combination of these options. Relations with ward councillors and the borough are all issues that have been raised by opponents in other areas and it’s clear that the model isn’t for everywhere and that there are issues to be addressed. It seems that whether the Wick gets a Community Council or not and the success of that council will be dependent on one factor: US, the residents. As with any local enterprise, it is what people make it. The make-up and ambition of a community council is a reflection of the local population. Would this work for our area? The people of Hackney Wick (the area bound by the Eastway, Railyway line and canal) will very soon be getting a chance to have their say. If more than 10% of the local population sign a petition to set up a Community Council, we could very soon be finding out. This article was written by our most enthusiastic gardener & Conservative Party Councillor hopeful - Mathhew Woods. Some of us have been lucky to work alongside him in the gardens - and will remember just how hard he grafts. And then other will remember him canvassing locally at the last election. Whatever your politics - you have to agree that Matt has Leabank Square & the rest of the Wick's interests at heart. Thanks Matt.